Soma Yukihira's old man runs a small family restaurant in the less savory end of town. 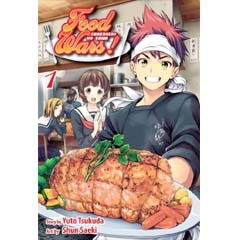 Aiming to one day surpass his father's culinary prowess, Soma hones his skills day in and day out until one day, out of the blue, his father decides to enroll Soma in a classy culinary school! Can Soma really cut it in a school that prides itself on a 10 percent graduation rate? And cacn he convince the beautiful, domineering heiress of the school that he belongs there at all? !